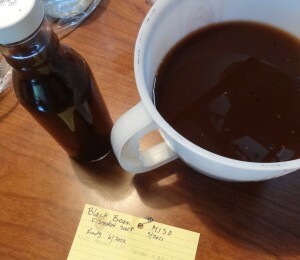 I started this batch of miso in May 2011. I harvested the tamari after 6 weeks, and replenished with salt brine. This miso formed no mold during its ferment, and I harvested tamari again when I harvested the miso last week. The second harvest of tamari tasted just as good as the first, which, for some reason, surprised me. This batch of miso was also very wet, and it might be because I did not smash the beans well in the beginning. 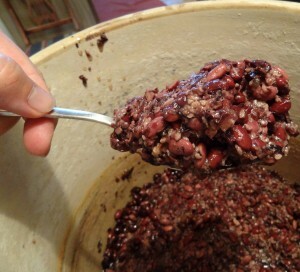 As you can see from the pics, the beans and koji are still intact (and the beans very tasty to eat whole). I used about half the miso to ferment duck and chicken egg yolks. They’ll be ready in about 6 months. I then used an immersible blender to homogenize some of the miso into a thick uniform paste. 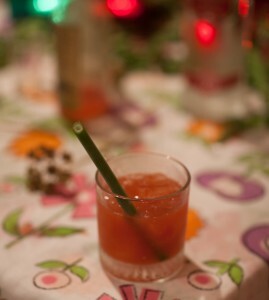 Fermenting vegetable juices is extremely easy, and the results are exceedingly delicious. Last summer I started with two cases of organic roma tomatoes. I sliced them in half, sprinkled on some smoked salt, and let it ferment in a crock for a week. After 2 days, the tomatoes were reduced to a thick slurry. 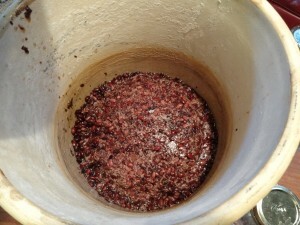 After a week, the pulp was removed from the seeds and skin. I stirred 2 or 3 times every day to reduce mold establishment. 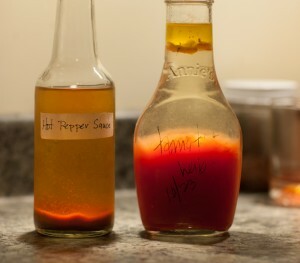 After a week I strained the seeds and pulp out, and filled narrow sauce bottles with the juice. I added a tablespoon of olive oil on top of the contents of each jar to prevent oxygen from contacting the juice. Then waited a year. Fantastic flavor! Last week we finally got our typical week or two of hot daytime temperatures and warm evenings here in Seattle. Perfect weather for cocktails in the garden. 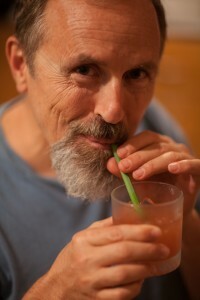 Drinking the cocktails from Loveage stems for straws was an added flavor, especially if the stem was chewed slightly. 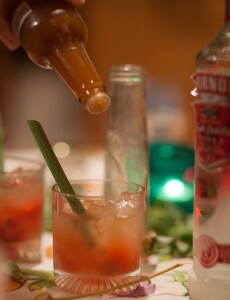 They were so delicious, we had to open another bottle of tomato juice and keep going. If you’re up for fermenting your own cocktail mixers, this is the best resource in know: Preserving Food Without Freezing or Canning by The Gardeners & Farmers of Terre Vivante, published in 1999 by Chelsea Green. What’s older than its Mother? My grandma told me that riddle while we were pressing apples in the orchard when i was 13. We had just filled a 50 gallon wooden barrel with the cider we pressed, and covered it in place in the root cellar to let it ferment. We wanted the vinegar. It never occurred to me that the riddle might have more than one answer. After fermenting water kefir for several months, I noticed a faint translucent mother had arrived on the surface of the finished ferment. It looked just like the young mother on vinegar or kombucha: thin and gelatinous. I fished it out with a scowl and discarded it after 4 or 5 harvests. The next time I went to harvest the kefir, there she was again. This time I saved her in a separate jar. As i replenished the sugar water over the kefir grains, I withheld a little of the solution for the young mother, covered both jars over and put them on the shelf to ferment. Ten days later, both had new mothers floating on top: small and thin (compared to kombucha or vinegar) but very much present. For the past year and a half, I’ve repeated this process when i harvest the original elixer: skim off the mother from the jar with the kefir grains, and add it to the jar now full of mothers. 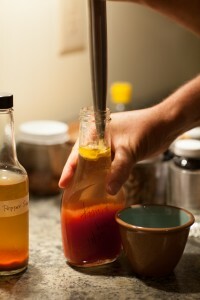 I now treat both jars (1-gallon size) the same, and I can’t tell any difference in the resulting beverage. I feed each batch one-half Meyer lemon and one-half dried fig each time I make a new batch. This flavor combination is really over the top. The jar with the kefir grains continues to form only a thin mother each time, where the jar full of mothers now forms a thick white mat, not unlike white wine vinegar mother.